Should I sell my Florida home now or is summer a lousy time to sell? Or is it best to wait until the winter when the snowbirds arrive, or perhaps until the spring? Does time of year really matter? And what about what's going on in the market? How should all of that play into my decision, or maybe it doesn't matter at all? Common sense tells us that the top time to sell a home is when the most people are buying. A top indicator of that is by studying "Absorption Rates" which estimate how many listings are selling. It's calculated by dividing the number of closed sales by the number of active listings. A low absorption rate means that homes are selling slowly (a buyer's market) and a higher rate means that homes are selling quickly (a sellers market). It makes sense to assume the best time to sell a Florida home is when the most people are buying. And The most sales activity in Tampa Bay is in the two middle quarters of the year. 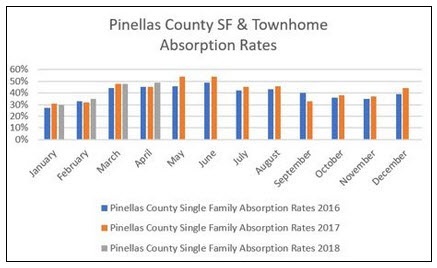 See the chart and graph above for Pinellas County single family homes and townhomes. By the way, the trends are the same for most of Tampa Bay. But wait! There are a few other things to consider if you are trying to time the market. Surprisingly, as you'll see above, and while spring and summer are the "hottest" times to sell, sales activity doesn't fluctuate as much from season to season as most people assume. Also, looking at the bigger picture always helps as market conditions are continually fluctuating. Right now now interest rates are climbing and the affordability index is declining, which equates to less buyers moving forward, particularly if you are selling anything above a "starter" home. The best time to sell a condo may be different, too. If you own a single family home with 3 or more bedrooms, the most likely buyer will have school-aged children, and the most activity will be before the school year starts. These stats also reflect that there's still time time to capture those relocating buyers that need a home by end of August when school starts. If you own a vacation type condo like on a golf course or on the beach, the timing may be different. And you certainly don’t want to rule out listing in the last quarter of the year. Condo and vacation home sales are typically higher in the winter months. The best time to sell your Pinellas home? If you're itching to downsize or upside, or have to for some reason you have to, anytime. Yet, generally speaking, this time of year for the past several years has been proven to be peak selling season. Copyright © 2018 JuliaP Fishel, PLLC. All Rights Reserved.